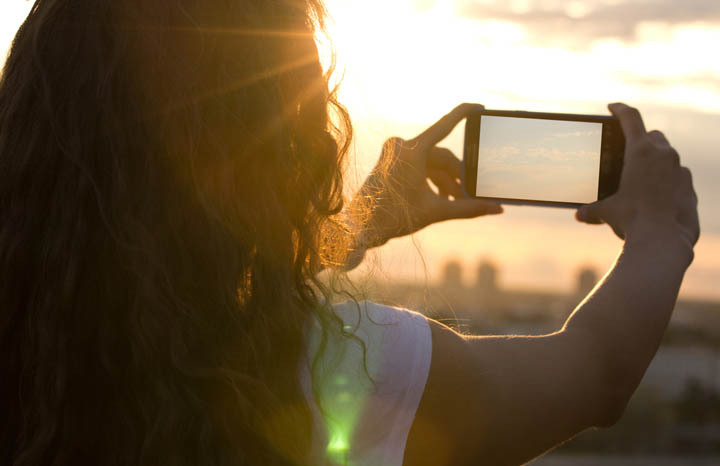 You won’t be able to get the best from your smartphone camera unless you’re really familiar with it. Knowing how to quickly activate your camera – so it’s ready for use – is particularly important. If you find yourself fumbling with the controls you could miss an amazing shot. Switch your smartphone to camera mode by selecting the camera icon, and have a play. Forget that natural reserve you might have had when shooting with film cameras. Like any digital camera, smartphone cameras aren’t limited to the number of shots on a roll of film – so don’t be afraid of shooting lots. If you’re taking photos of people – and especially groups – take two, three or even more shots to catch both natural expressions (people tend to be stiffer and more posed when taking single shots) and to reduce the chance of shots that might be spoiled when people blink. Smartphone cameras are so convenient for shooting photos that we can sometimes become a bit relaxed about using them. We tend not to hold them too firmly or steadily when shooting – which means it’s all too easy to get a photo that’s not critically sharp, or is downright blurred, especially when light levels fall. Avoid this by practicing hold to your smartphone firmly and if the light levels are a bit dim use impromptu supports – such as fence posts, chair backs or walls to help steady your shots. When you shoot photos in bright sunshine, results can often disappoint: the brightest parts of the scene are white and featureless and the shadows dark and murky. Camera designers have a cunning way to correct for this lighting and deliver much better results. It’s called HDR. The mechanics of how it works are perhaps a bit beyond us here, but suffice to say, if you select the HDR setting on your camera you’ll get brighter shadow areas and less extreme bright areas – altogether a much more successful shot. Did you know you can override your smartphone camera’s autofocusing system with the touch of a finger? Your smartphone will make a best guess at getting the focus right and, most of the time, gets it spot on. Sometimes, though, you want to focus at a different setting – on a subject at the side of the scene or perhaps something in the foreground. To change the focus position just tap that spot and the camera will refocus. And often it will adjust the exposure too to give you a perfect shot. Smartphone cameras are so proficient at delivering good photos so much of the time that we can sometimes ignore their shortcomings. One of these is the flash. It’s not powerful and the results it delivers are unflattering to any subject. That’s a bit of a shame, particularly if you like shooting where the lighting is poor. Instead, try shooting without flash – the results will sometimes be mediocre, but often much better than flash would deliver. Just hold your camera steady – as we’ve already discussed above. Learning some of the compositional rules of photography can turn a good photo into a great one. And here’s an excellent one to practice: the Rule of Thirds. Put your main subjects or main features in your shots either one third of the way in from an edge. So a horizon would go not dead centre but one-third the way from the top or bottom edge. Your portrait subject would stand one-third of the way in from the left or right edge. Try it and you’ll see how this simple rule really does improve the composition. But don’t overuse it. Rules are, of course, meant to be broken so if you think an alternative approach will work better, use it!